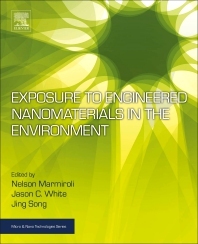 Exposure to Engineered Nanomaterials in the Environment provide a new, holistic framework for testing and evaluating the potential benefits and risks of engineered nanomaterials (ENMs), including their potential socioeconomic impacts, ethical issues and consumers’ expectations and fears. The book covers nanomaterial presence in various environments, agroecosystems and other areas within the human sphere of actions. The book includes sections on (i) Chemical, physical and biological properties, (ii) Presence and diffusion of ENMs in human environments, agriculture, food and drug products, (iii) ENMs as a pillar in biological and medical research, and (iv) Social and regulatory issues emerging from years of application. The book is designed to increase awareness to key end-users and stakeholders, including food producers and processors, industry, representatives of society and consumers, and those looking to implement an accurate and effective risk analysis procedure that promotes the sustainable use of nanotechnology. Prof. Nelson Marmiroli is a full professor of Recombinant DNA Technologies, and of Food Production and Genetic Resources at the University of Parma. Prof. Marmiroli coordinates a team including over 20 among full professors, associate professors, research associates,technicians, post-docs, PhD fellows. His current research topics are focused on application of environmental biotechnologies for sustainability; phytoremediation, bioremediation, emerging contaminants (nanomaterials), interaction of plants with pollutants, genetic and molecular bases of genotype-environment interactions in different organisms (proteomic, genomic, transcriptomic analyses); molecular traceability of food supply chains for food safety and authenticity protection. Milton P. Gordon Award for Excellence in Phytoremediation, Editorial Board of the International Journal of Phytoremediation. Dr. Jason C. White is vice director and chief analytical chemist at the Connecticut Agricultural Experiment Station (CAES). Dr. White received his Ph.D. in Environmental Toxicology from Cornell University in 1997. After one year as a post-doctoral associate at CAES, Dr. White joined the Department of Soil and Water in 1998. In 2009, he assumed the department head position in Analytical Chemistry and in 2013, was also appointed as vice director. The CAES Analytical Chemistry Department provides sample analysis to all other state agencies, and also participates in the FDA Food Emergency Response Network (FERN) Chemistry Cooperative Agreement Program (cCAP). Dr. White also has research programs in two separate areas: nanomaterial contamination of agricultural crops, as well as the phytoremediation of soils contaminated with persistent organic pollutants. Dr. White also has adjunct faculty appointments at the University of Texas−El Paso, University of Massachusetts, the University of New Haven, and Post University. Managing Editor of the International Journal of Phytoremediation. Dr. Jing Song received his PhD Degree in Soil Chemistry in 2002 at the Institute of Soil Science, Chinese Academy of Sciences (ISSCAS) and became an associate researcher in 2005. He served as Deputy Director of the Soil and Environment Bioremediation Research Centre (SEBC, ISSCAS), and Deputy Director of the CAS Key Laboratory of Soil Environment and Pollution Remediation (KLSEPR, CAS). Dr. Song's main research interests include bioavailability of soil pollutants, derivation of risk based soil environmental standards and R&D of physio-chemical remediation technologies for polluted soil/site. He has been active in joint research projects with Rothamsted Research, UK and Wageningen University and Research Center, the Netherlands. Dr. Song is a member of the Soil Environment Committee, Chinese Society of Soil Sciences, Senior Associate Editor for heavy metals of the International Journal of Phytoremediation, a member of the Board of Directors of the International Society of Phytotechnology.